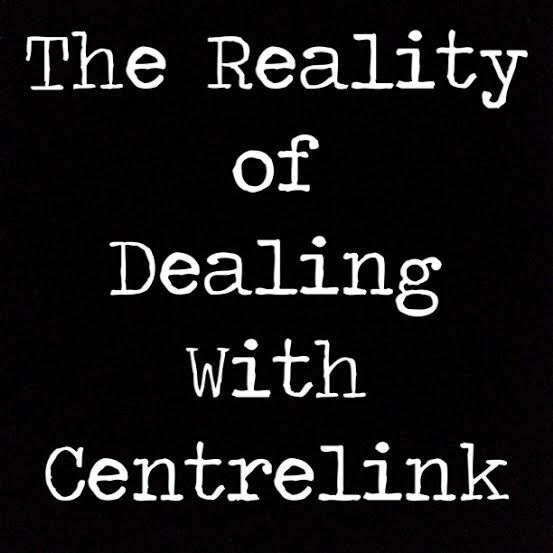 As frustrated as I am about talking to and about Centrelink, I thought I would outline the reality of dealing with them. Maybe it will counteract some of the current, mainstream media supported perception that every single person out there who is eligible for government assistance is a lazy dole bludger who doesn’t want to work. There was a certain irony that I was sitting in the reception of an office on Friday, reading the paper as I waited for a job interview, and there was an article about how terrible all job seekers are and how none of us want to work. For some background on my working life, it’s best if you read this post of mine on Kiki & Tea. It explains this year & my circumstances. I’m now at the stage where today is my last day at my current employer on my contract. My current employers have kindly offered me a casual contract until the end of the year. This is true casual though – there is no guarantee of work or hours at all. It is a lovely offer that allows me to keep applying for internal jobs and maybe the odd day of work while I am seeking another job. They are great to work for and I’m sad to be leaving them. My Centrelink account has expired (for lack of a better word) because I exceeded the income requirements for six fortnights. Due to it happening only recently, I was advised that I could lodge a new claim to Newstart, which would be an abridged claim. I stopped by the Centrelink ‘light’ (a non full service office that has been combined with Medicare ever since the previous full service Centrelink office burned down the other year) on the way home from a job interview on Friday. They informed me it was easy to lodge a new claim online. Want more from NormalNess? Sign up for my newsletter here. I went home and logged into my Centrelink online services. I went through the new claim. Nope. It only brought up my claim from around April this year. I called the customer service line and spent an hour on the phone as we tested passwords, linked my Centrelinke account to MyGov and tried a lot of other little things. Nothing worked. In the end, the woman I was speaking to recommended I go into an office to lodge the claim as she didn’t know why it wasn’t working. I drove to the nearest full service office and spoke to the customer service triage person (as I like to call them). I explained I needed to be “reactivated” and I had spent an hour on the phone to make it work. He suggested I go home and do it online. I repeated what I had just said and that the woman on the phone specifically told me to come into an office as it was not working and neither she nor the technical support staff she was chatting to could say why it wasn’t working. I sat down, and was called on by staff shortly after. The lovely trainee who was helping me managed to set my new claim up in about 15mins, even as she was going to ask questions from more experienced staff members. She scheduled me a phone interview for Monday morning between 9.45am and 10.30am. Thinking all was mostly set, I went about my weekend. Come Monday morning, I had my calendar booked out at work for that time in case anyone needed me while I was on the phone interview. I kept glancing at my phone and nothing happened. At 12.16pm on Monday I receieved an SMS staying I had a phone appointment at 9.45am. 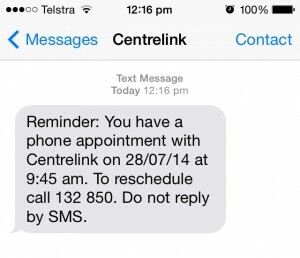 I asked my husband to call Centrelink for me and find out what was going on. They rescheduled the appointment for Tuesday at 9.45am. Yesterday I sat there, waiting for my phone to ring. It didn’t. At 10.20am I received an SMS saying that I had a phone interview at 9.45am. I figured that was progress, at least it was closer to the appointment time than Monday! 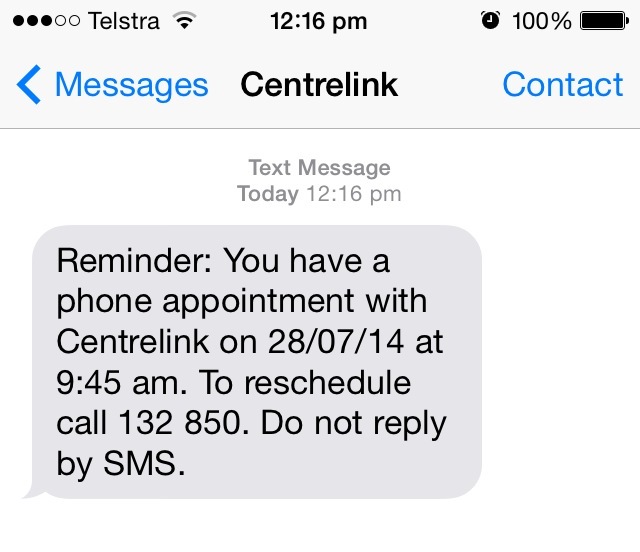 I waited until 11am and when I’d had no calls, I again asked Ben to call Centrelink again. They told him that he should call back after 1pm as it was reporting day and they were probably just behind on making the phone calls. Great customer service. When I have a job and I’m delayed on something, I let my clients, stakeholders and/or colleagues know that I’m delayed and when they can expect it. But you know, that’s just me. I waited until 1pm. Still no call. My phone was working because I had other calls from job agencies about possible roles during that time. And I test called my mobile from my work phone. Yep, working. So it was the poor husband’s turn to call Centrelink again. This time they thought it might have been incorrectly booked as an in-office appointment (but I doubt that, seeing as the SMS details were correct). And apparently in my file there are references to a phone appointment. What that means, I have no idea. I have a sneaking suspicion they have no idea either. The guy made a record of the troubles and said they will fix it soon. Of course, we didn’t get a chance to find out what that actually meant, because you know when you’re on the phone to Centrelink and the line goes dead? Yeah. That happened. In the meantime I had tweeted the Department of Human Services on both days. 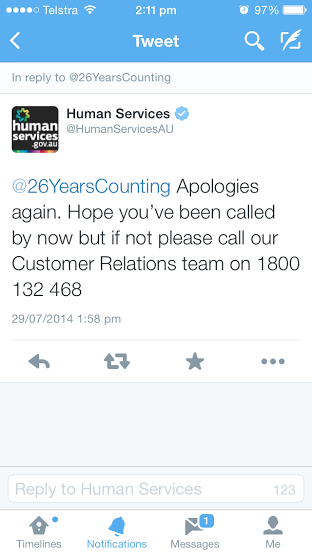 The first reply (on Monday) wasn’t all that helpful, because it was just “call the newstart hotline”. When it happened on the second day they recommended I call their customer relations team. Of course, as nice as it is to be tweeted a phone number, none of that matters when you work in an open plan office and it’s both inappropriate as an employee and not confidential at all to make those calls during Centrelink’s opening hours (the customer relations team is only open 8am-5pm and I am working or commuting during those hours). No one wants to call Centrelink three times in a day, so I left my poor husband alone (bored out of his mind by the dullness of doing this for me), and we (he) will face it again today with the customer relations team. They have all of my paperwork (bar my separation certificate, which can’t be given until my contract formally ends & I’ve been paid out all money/leave due), so the barrier for me to access money I need and am eligible for, is this one little phone interview. Are you “supposed” to talk about money in these circumstances? I don’t believe money defines me so I don’t really care if you judge based on my bank balance. I don’t “feel” poor. I’ve had jobs that paid a lot. I was lucky enough to be able to buy a car brand new 5 years ago with a small loan that I paid off in a few months. I have a small amount of debt, gained in my attempts to pay bills while under-employed, but that will be cleared quickly when I have a full time income. I don’t like debt. 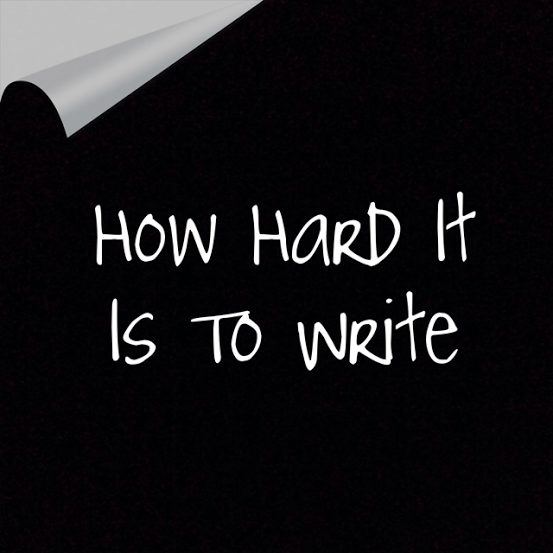 I’ve debated if I want to write this. I don’t want to be trolled or spammed by people who won’t read this and will just abuse me for seeking the assistance I am eligible for. But I haven’t seen anyone else writing about this, so I feel like a lone and invisible voice, much like when I wrote that Kiki and Tea article. I’ve also been inspired by posts like this one to tell my story. Because if I don’t, how will anyone know that there genuine people out there? The media sure as hell doesn’t seem interested in a genuine story. I don’t want either of us to be on Centrelink. I would much rather work (day job AND freelance) than have to deal with them. I don’t believe I have much need of them in the grand scheme of things, but I do have need for them now. I’m not denying that there are huge issues with welfare for some aspects of society. Or that costs may spiral out of control, especially with an ageing population. Or chronic under-education in some areas of country. Or any of the other hundreds of factors that can be a barrier to employment. But I’m also not going to sit here and pretend I have the appropriate education, work experience or knowledge to solve the issues. Also, if I’m struggling to deal with Centrelink efficiently, and I have experience working in government and within bureaucracy, then how on earth do people with low literacy levels cope? It must be so very hard for them; I literally can’t imagine the barriers they must face. All I know is that there are many options and punitive measures like work for the dole (as announced this week) don’t work. You know what stops unemployment? Jobs. I wish people could put their efforts into creating jobs instead of complaining about people who apply for things that they’re eligible for. Ideally flexible jobs, so that people with caring responsibilities or chronic conditions can work around their lives. I think it will be interesting to see how the Australian workforce responds to an ageing population, because surely there will be more of us with aged caring (as well as child and illness related caring) responsibilities soon. Let me also talk about the lack of a full service local office. For a car driver, the now 15min drive to the nearest full service office isn’t a huge deal. Inconvenient, especially if working around a job, but not a big deal in the grand scheme of things. However, for those without a car, it take between 55mins to an hour and a quarter, on public transport routes that only run hourly. That is a huge barrier to being able to keep appointments if you have certain medical conditions that mean reduced energy. Do you have any tips for keeping your sanity while dealing with under-staffed, complicated government departments? Or a grand solution that actually helps people? 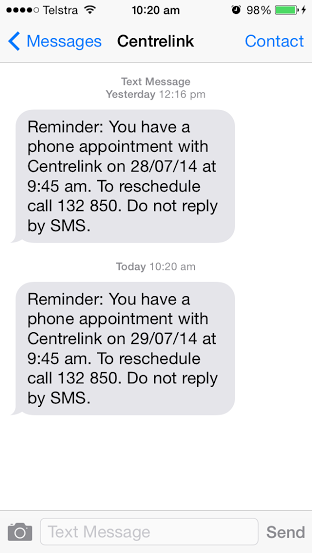 Today Ben once again called Centrelink for me. He called the customer support line. They tried to put him through to a manager, but all were at lunch and they couldn’t get onto anyone. He was told I was going to be called today. Want to take one guess as to if I’ve received a call from Centrelink? If you guess no, you’d be correct. So this is now three days in a row that they’ve had one kind of arrangement or another to call me, and haven’t. But I’m sure this is somehow my fault. I’ve found whenever I have had these kind of being-given-the-run-around problems with them I lodge a complaint on their website and have usually had it resolved by their complaints team within 2 days. It’s just ridiculous – personally if people are worried about wasting taxpayers money I’d be looking into Centrelink inefficiencies to start with! Hoping to have some sort resolution soon, and man I owe my husband for making all the calls for me!! I had my own horrid experience with them this week. 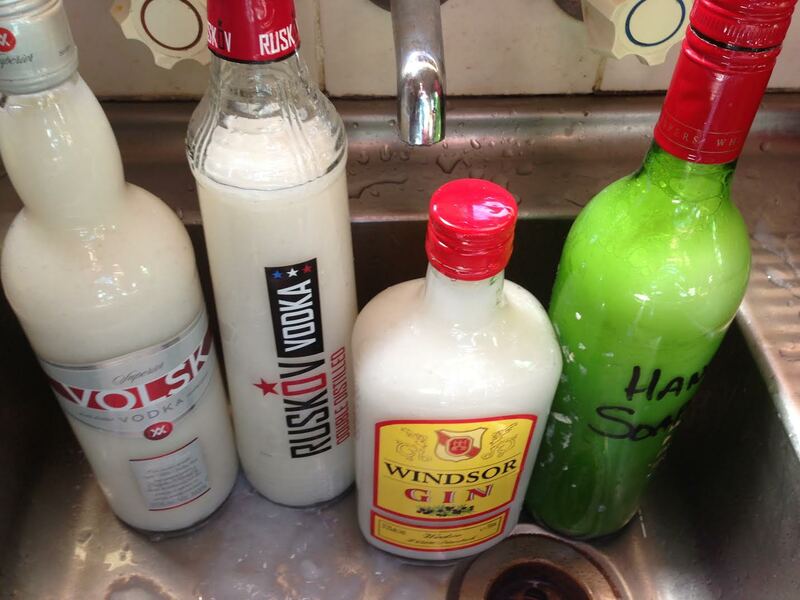 Absolutely horrid and I could write an entire blog post on it as well. I’m generally not a fan of privatisation of government services, but perhaps if they did they would be forced to maintain an acceptable level of customer service in order to remain in business. It is just staggering that a system of this size can fail so abysmally so often. Thanks for sharing! You’ve got to wonder if privatisation would enforce some standards! I’m a bit the same, some things are a bit more ‘meant’ to be government than private, but this is getting beyond plausible – three freaking days in a row no one has called me as they’ve said they would. No judgement from me, we all do our best to live our lives and Centrelink is sometimes part of life. I’ve had so many dramas trying to deal with them, my answer now is that I don’t. I leave it all to my husband who seems to have the Centrelink Parseltongue, I don’t know how he does it but they are happy to be efficient for him. Haha maybe I could contract out talking to Centrelink to your husband! Now there’s a business idea! Hi. The nearest Centrelink (Any level service) office to where I live is about 160kms away so we RELY on the phone interview as our only real contact with Centrelink at all.. and yet time after bloody (sorry) time they DONT call and payments are cut immediately as “YOU didnt attend a scheduled interview”.. it MAY be a government department all shiny and in such control, but i cant help imagining monkeys dunking phones in fish tanks and flinging poop at the line up of skeletons STILL WAITING to just speak to SOMEONE who A CLUE…..
i’m so sorry to hear that Leonie. It’s frustrating when their system fails and the wording of their messages is blame on you. I really feel you there. I hope things get sorted out for you soon. It was very hard when I was stuck on part time contract jobs, because I would get paid “too much” for just long enough to be cut off, then the job would end & I would have to rejoin, but then I would get a job and be unable to attend in person, but I still needed the money as I had no cash flow…and around it went. The casualisation/contract nature of work is a real impact that I think people are ignoring.